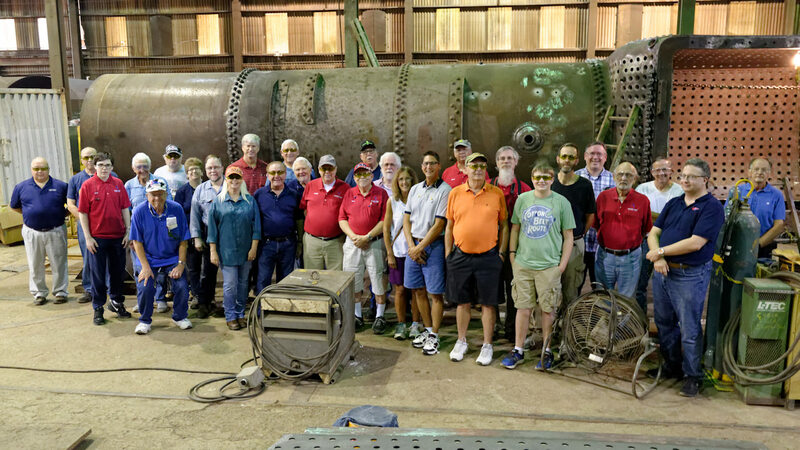 On Saturday, September 15, 2018, a joint group of 30 railfans from the St. Louis Chapter NRHS and the Gateway Division NMRA toured Continental Fabricators to learn how boilers, particularly steam locomotive boilers, and other heavy vessels were made. Fred Steinkuehler and Tom Gerstenecker of Continental Fabricators gave us an extensive tour of the shop. We learned a lot more details and appreciation for what special expertise it takes to fabricate, restore and rehab steam locomotive boilers, with a better insight into the equipment and labor used on the boilers and other heavy vessels. This was our group’s first tour of a fabrication shop under actual working conditions as Continental Fabricators operate their shop 24/7, three shifts per day. There was plenty of “background sounds” (noise) to make the tour even more interesting. We saw the new pressure vessel, a 3-1/2 course boiler and smoke box of Pennsylvania Railroad T1 No. 5550 4-4-4-4 steam locomotive; a new boiler for Mid-Continent Railway Museum former Chicago & NorthWestern No. 1385 4-6-0; and restoring boilers for U.S. Sugar Co. 4-6-2 No. 148, Grapevine Tourist RR No. 1344 and a miniature boiler for Wabash, Frisco & Pacific Tourist RR. We thank Ron Gawedzinski for arranging the tour and Fred and Tom from Continental Fabricators for their expert narration of the shop tour. View a photo gallery from the Continental Fabricators NRHS-NMRA tour. Ron Gawedzinski is the Gateway Division NMRA Outside Activity Coordinator and models the late 1940s through early 1950s Appalachian Mountains areas in HO scale. He was the past Secretary of the Gateway Division NMRA and the past Secretary and President of the St. Louis Chapter National Railway Historical Society. He is the St. Louis Chapter NRHS Outside Activity Coordinator.